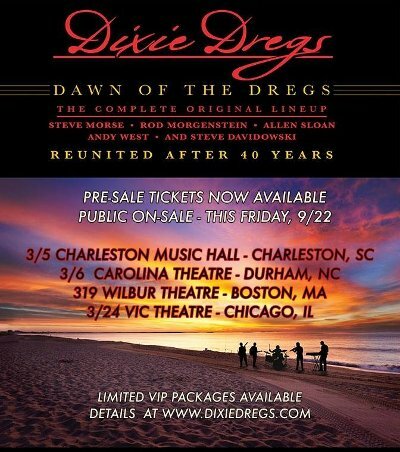 Critically acclaimed six-time Grammy-Award nominated musical virtuosos The Dixie Dregs (a.k.a The Dregs) have reunited for their national “Dawn Of The Dregs” U.S. Tour, which begins February 28 in Clearwater, FL at The Capitol Theatre. The performances will mark the first time in 40 years the original band–Steve Morse (guitar), Andy West (bass), Allen Sloan (violin), Steve Davidowski (keyboards) and Rod Morgenstein (drums)–will share the stage.The band opened up in a Q&A about memories from the early days (including a performance at the legendary NYC punk venue CBGB’s) and their excitement to reunite and perform again. .
Tickets are on sale now for the 33-date tour which makes stops in Charleston, Washington D.C., New York City, Boston, Pittsburgh, Cleveland, Chicago, Milwaukee, Boulder, Dallas, Sacramento, Fresno,New Orleans and Phoenix, among many others,before wrapping in Atlanta on April 28 at Center Stage Theater.